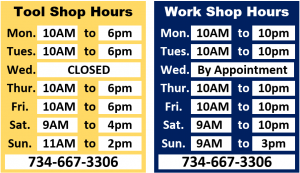 The Work Shop is a membership based workshop for businesses, entrepreneurs, tradespersons, craftsman, artist and hobbyist. The Work Shop provides our members with with an awesome shop space, filled with high end wood and metal working equipment. We have four distinct areas for your projects: woodworking, metalworking, welding and computer/printer. Each area has ample work space with benches and project space for your use. In addition, we have a tool crib containing clamps, drills, sanders and other equipment needed for your project. Contact The Work Shop and we’ll be happy to give you a tour. Click here, to see are membership rates. The Work Shop is the sister company of The Tool Shop (click here to go to The Tool Shop). What is The Tool Shop? We are a consignment store where we sell your tools and equipment, whether you’re a homeowner, contractor, property manager or business. The Tool Shop makes selling and purchasing quality used tools and equipment hassle free. Initially located in Canton Michigan, The Tool Shop outgrew our building. We have some great customers, and meet some great people. One thing we heard from them – a lot – was, can I just use this piece of equipment. Out of that request, The Work Shop was born. As a member of The Work Shop you build the things you never thought possible. You can also take classes, and learn new techniques and skills on some of the best equipment available. AND, you leave the dust to us! Stop by the shop, we’re proud of our facility and would love to show you around.